By now you may have noticed some updates to our site, and to our document viewer. Behind the scenes here at Footnote, we’ve been incredibly busy working on some changes and other updates to our site, and one of the biggest changes is getting “Zelda” online. Who, or more appropriately, what is Zelda? Zelda has been the code-name for the newest iteration of our Document Viewer. (The name “Zelda” comes from my video game hobby obsession.) Zelda is a completely new Viewer, having been rewritten from the ground up, using ActionScript 3.0. But why am I telling you this, and why should you care? ActionScript is the programming language used to create Flash-based websites, games, and other web applications. Because of the tremendous amount of Flash-based content on the internet today, each version of the Flash Player needs to be backwards-compatible with previous versions, meaning that if you had some Flash content (like a game or website) that was made for Flash Player 5, it still needed to work in Flash Player 8, 9, 10, etc. As a result, the virtual machine inside the Flash Player that ran the ActionScript code began to get a little big, and some needed changes to update the language just couldn’t happen, because changes to the Actionscript language could break existing Flash content. With Flash Player 9, the engineers behind the Flash Player took the opportunity to create a new virtual machine that could run a new version of ActionScript, (ActionScript 3.0), and would be rebuilt from scratch, without the need to support all previous versions of the language. The end result is a virtual machine that can run code nearly ten times faster than the previous versions of the Player! By the way, Flash Player 9 includes both versions of these virtual machines, so having Flash Player 9 to use our site doesn’t mean that you won’t be able to use older Flash content on other sites. The Flash Player is smart enough to know which virtual machine it needs to use in order to display Flash content for you. The faster code execution of AS3 also means that in addition to larger documents, we can display more information about those documents. We’ve been doing regular testing of documents that have 200+ annotations on them just to make sure that they work well. We’ve also made some tweaks under the hood to the Viewer – things that you may not see immediately, but you’ll be glad that they’re in there. 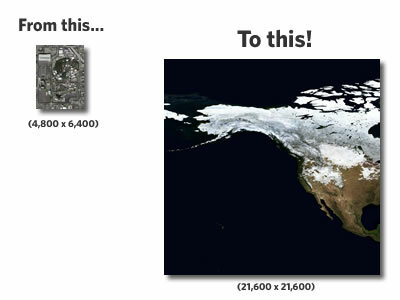 Loading a document’s image tiles or saving an Annotation now happens much faster. Under the hood, the Viewer is loading a lot of data from our servers to display a document. 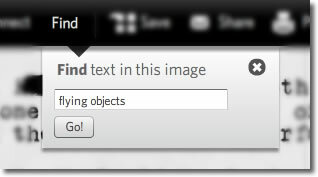 This data includes image tiles used to display a document, text data about the document, lists of Annotations, Spotlights, etc. We now prioritize the image tiles, which means that you’ll be able to see the document and start zooming around it earlier, without waiting for the “About This Document” panel to load, or the list of related documents across the bottom of the screen. Also, if you decide to save an Annotation (for example), this request to our servers is placed in line before loading anything else, including image tiles. It means less downtime waiting for a request to save that annotation while there are image tiles being loaded. We also try to store other items might be requested multiple times, (like user icons) so that you only need to load them once, saving you download time. Lots of little things, but they add up. We’ve also made a few design changes. In addition to giving the Viewer a facelift, we’ve moved a few buttons to places where they make more sense, and tried to make things a little more usable. For those of you using smaller monitors (down to 800 x 600), you’ll always be able to see every button in the toolbar. Buttons will no longer be hidden in a small popup menu as the toolbar shrinks. We’ve made a few tweaks to text in order to make it a little more readable, and have made text selectable in various places, so that you can copy & paste to your heart’s content. We’ve also added a few new features to the Viewer. For instance, you can now Connect documents to other documents via the Viewer. Many times, documents will be related to one another, and using the Connect button, you can share any Connections you may find with other users as you find them. We’re willing to bet that there have been several times that you’ve found a document that you think your friends would love to see. (It happens all time around the office here.) When this happens, Share it with them! Or, Share it with up to 20 of your friends! About a month ago, we introduced the ability to organize your Gallery into Collections. The Viewer has always allowed you to save documents into your Gallery, but it now gives you the option to also save a document directly to a Collection in your Gallery, or even create new Collections in your Gallery. Now for one of my favorite new features – want to find a certain word in a document? We’ve got some more amazing features to share with you coming up. Unfortunately, we don’t always have time to get everything that we want to do in each update. However, that means that you’ll always have new features or other enhancements to look forward to. As always, we’ll let you know when there’s something new to play with, and of course, if you find that something doesn’t work exactly like it should, or even like you think it should, let us know! Is it just me, or is Zelda running slower these days? I can’t tell if it’s my internet connection or footnote, but it doesn’t seem to be this bad on the other sites I use. When I try to view a page, it takes twice, maybe three, times as long to load an image as it used to. And another thing that is annoying me, and this is definitely not my connection, is that when I click to view a document, it used to only show the related documents in the filmstrip, and now for some reason, it shows unrelated documents too. And I really don’t like the sidebar defaulting to the other things I might be interested in. At that moment, I’m only interested in what I’m looking at. Hey, but I love the site. 🙂 Keep uploading! we have seen some occasional slow downs with some Internet providers. we are updating the site next week to improve perfomance. Albert, we’ll contact you via email this coming week and get your account sorted out. Sorry for the confusion. I removed your comment to protect your personal information. 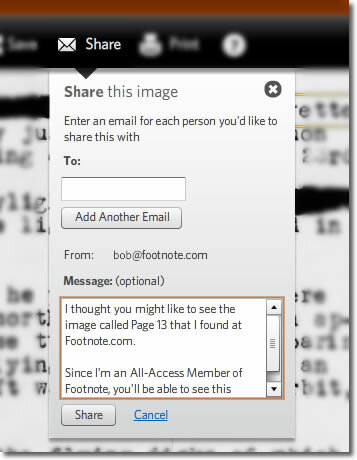 You can always contact us at support@footnote.com.